Harrington, Zita Ann 8/19/1926 - 4/3/2017 Saginaw, Michigan Passed away peacefully on Monday, April 3, 2017 at Cartwright Hospice Residence. She was 90 years old. Zita Ann Loeffler was born on August 19, 1926 in Saginaw, to the late Walter and Irma (Quinlan) Loeffler. 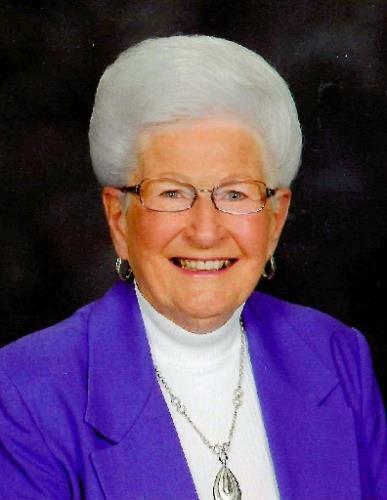 She graduated from St. Andrew High School in 1944. Zita married Rolland J. Fisher in February of 1947; they shared 19 years together until his death in April 1966. She later married Richard Harrington on April 14, 1972; they shared 33 years together until his death in January of 2004. Zita leaves behind son, Thomas W. (Cathleen nee: Vollertsen) Fisher of Palatine IL; daughter, Laura (David) Haiderer; daughter-in-law, Debbie Fisher nee Burman who was married to Zita's son, James Fisher (deceased in 2010); five grandchildren: Brenton Fisher of Palatine IL, Mallory Fisher of Peoria IL, Rebecca Fisher of Chesterfield MI, Eric Haiderer of Florida; and Ashely Haiderer of Columbus IN. Zita also leaves behind many nieces, grandnieces, nephews, and grandnephews, as well as her very dear friends and neighbors at Rose Cottage Lane Condominiums. The family would like to extend a heartfelt thank you to those that cared for Zita during her brief illness. Zita's life was inspirational. She will be deeply missed. FUNERAL: Honoring Zita's wishes cremation has taken place. A Funeral Liturgy will take place at 11:00 a.m. on Saturday, June 10, 2017 at Holy Spirit Catholic Church, 1035 N. River Rd. VISITATION: Friends are welcome to visit with the family at the church on Saturday from 10:00 a.m. until the time of Mass. MEMORIALS: In lieu of flowers, those planning an expression of sympathy may wish to consider memorials to Holy Spirit Catholic Church. Arrangements have been entrusted to the Deisler Funeral Home, 2233 Hemmeter Rd. (off State). Please share your thoughts and memories with the family at the church or through www.deislerfuneralhome.com.